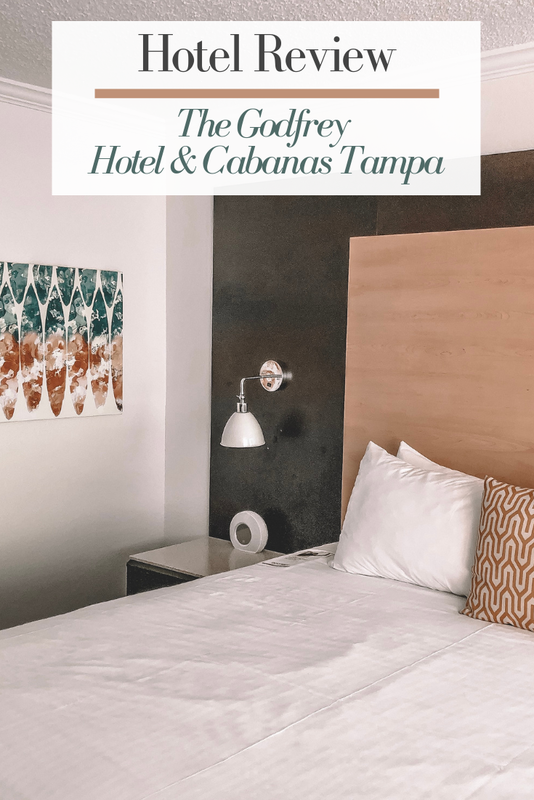 Over the weekend, I was able to stay one night at The Godfrey Hotel & Cabanas off the Courtney Campbell Causeway in Tampa, Florida. I love having staycations near my hometown and I was excited to spend the night at The Godfrey in one of their rooms. I invited some girlfriends to join me in the fun at this luxury hotel for the night. We were treated to dinner and treats the next morning at their cafe with the overnight stay! A huge thank you to the Godfrey Hotel for hosting us for the night. Our room was on the fifth floor of the hotel. We had a balcony view overlooking the water and the sunset which was perfect as we got ready to head down for dinner. The room had the essentials -- a mini fridge, TV, desk, and coffee maker. Our room was the King Bay View Room that had modern amenities and stylish beachy decor. The bathroom had a large light-up mirror and complimentary shampoo and conditioner as most standard hotels will provide you with. Complimentary Wi-Fi is also included with your stay, which is very important to have as a guest. For dining options, you can relax poolside and enjoy your meal at the bar or inside their main dining area. We chose to sit outside under the umbrellas for dinner. While sitting at the bar waiting for another friend to arrive, two of my friends ordered drinks. One had a pina colada and the other had a strawberry margarita. Very tropical drinks! The WTR Pool & Grill menu has seafood favorites, like Coconut Shrimp, and hearty entrees, like Steak Frite. I went with the steak and vegetable medley for my dinner! I was extremely satisfied with my meal, as my steak was cooked perfectly to my liking and the vegetables were coated in a delicious butter and garlic sauce. I also wanted to try one of their desserts so I ordered the Tres Leches Chocolate Cheesecake, yum! It did not disappoint. After every meal, I need some dessert! Anything chocolate has my name on it. One of the best perks to staying at The Godfrey would have to be the pool deck. You can easily sit around the pool for hours while reading a book or finishing up a cocktail with friends. The giant blue pool is conveniently right by the bar, too. The daybeds and cabanas are available for you to rent. A DJ will be spinning music on the weekends if you are looking for a party atmosphere right outside your hotel room. While we chilled by the pool on Sunday we heard some music from the DJ! The WTR Pool is known for hosting events every month. Check their Instagram page for more updates to schedule your trip around the fun pool parties. They also have an exciting event for NYE, where Mario Lopez will be the host!